As with the parent compound, a C2 and Cs form were located at B3LYP/6-31G(d,p), and are shown in Figure 1. The C2 form is 7.6 kcal mol-1 lower in energy than the Cs structure, and the two are separated by a transition state (also shown in Figure 1) with a barrier of 12.2 kcal mol-1. The interconversion of these conformations takes place without going through a planar form. 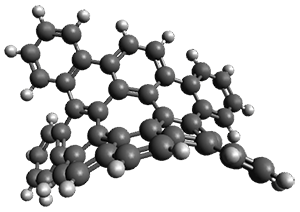 The x-ray structure contains only the C2structure. It should be noted that the C2 structure is chiral, and racemization would take place by the path: 1-Cs ⇆ 1-Cs ⇆ 1-C2*, where 1-C2* is the enantiomer of 1-C2. Figure 1. B3LYP/6-31G(d,p) optimized structures of 1. 1) Hatanaka, M., "Puckering Energetics and Optical Activities of Circulene Conformers." J. Phys. Chem. 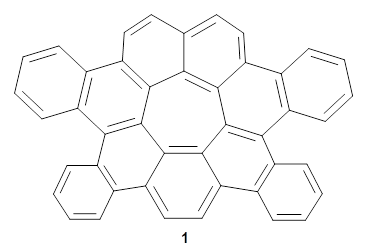 A 2016, 120 (7), 1074-1083, DOI: 10.1021/acs.jpca.5b10543. 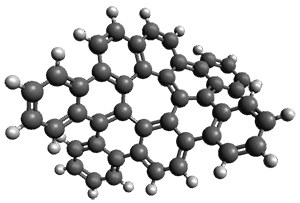 2) Yamamoto, K.; Harada, T.; Okamoto, Y.; Chikamatsu, H.; Nakazaki, M.; Kai, Y.; Nakao, T.; Tanaka, M.; Harada, S.; Kasai, N., "Synthesis and molecular structure of circulene." J. Am. Chem. Soc. 1988, 110 (11), 3578-3584, DOI: 10.1021/ja00219a036. 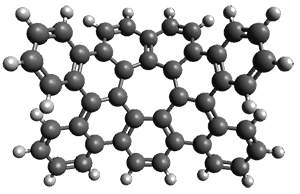 3) Gu, X.; Li, H.; Shan, B.; Liu, Z.; Miao, Q., "Synthesis, Structure, and Properties of Tetrabenzocirculene." Org. Letters 2017, DOI: 10.1021/acs.orglett.7b00714.